One thing guests love reaching for at a party is a big bowl of party mix. NESCO Roaster Ovens help make it simple and convenient. The possibilities of ingredients are almost endless. Here is a quick recipe along with suggested additions. 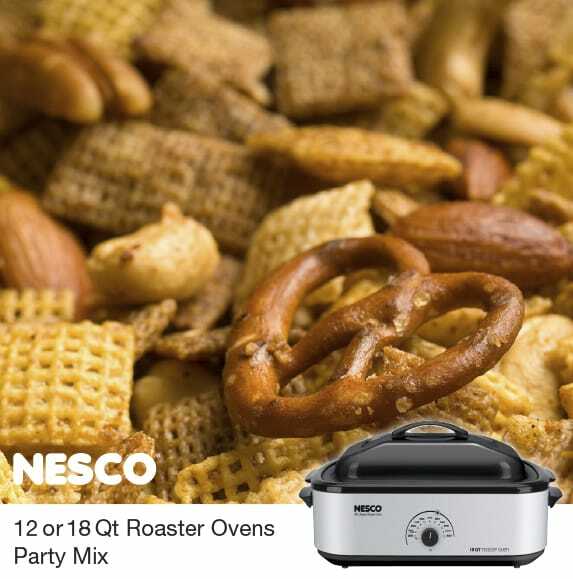 Preheat NESCO® Roaster Oven to 300º F. Place cereal in cookwell. Stir butter and Worcestershire® sauce together and pour over cereal. Cover and bake at 300º F for 45 to 60 minutes. Stir occasionally during baking. Add nuts and pretzels. Cool before serving or storing in airtight container. Let us know some of your favorite party mix recipes or tasty added ingredients.